Monday needs a suit, even if it's not required. I kept testing my new grey one, and will give it a few more wears before doing any "final" alterations. I love brown ties. For some reason they are simply it for me. Admittedly they work the best with navy, but it's not all bad with grey either. Especially when the shirt is light blue. This piece of candy is a 7-fold cashmere Briono I found from a Barney's at San Francisco for just 60 dollars. A rather ridiculous price for a tie that has the most amazing herringbone texture and is so soft to touch it cannot be described. 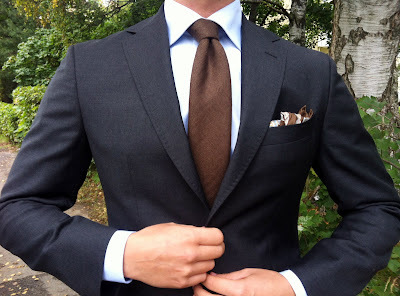 The spread collar is just right for the tie, and the hues of brown and blue in the pocketsquare complement the overall combo. As shoes I had my penny loafers again. I'm really just a loafer kinda guy, and now that the fall is starting to hit me in the face the suede tassel loafers just don't work that well anymore. At least not in the rainy days. The socks are dark brown wool. So there we go and another month has started. From now on I'm probably going to be quite busy working and trying to write my Master's Thesis at the same time, but I'll try to post at least a few looks per week. Stay sharp and those of you in the South enjoy the rest of the summer while it still lasts.